Arms reaching out and giggle. Posing in front of the aquarium. The dolphin saying hi to Alex! Hi everyone, sorry I haven't posted in a long time but over the past seven days or so, I was fighting with the sore throat and cough virus / bugs. I have so many pictures to post from my last weekend, but as I said in my previous post, I've been so disturbed by my sore throat problem and works demand my attention. In addition I now have to get ready for another Expo in Singapore (MTA Expo March 28 ~ March 31). My boss rang me on Sunday (it was last minute call) as they are short handed with staffs to look after the show. I don't like Expo so much but I haven't gone to S'pore for quite some time either. So I hope I can sneak to go shopping or spend my time with my niece over the weekend. Lindsey is so excited am going to stay in her place. Last night I was busy packing things for her, mostly food! Anyway, above are the pics from last weekend with my nephew, Alex. He took his first wobbly steps only about 3 weeks ago. From then on his steps became more steady, but he would still only take a few steps and then plopped down to his bum. This past weekend he just started taking off. He can walk across rooms, turn around, and climbing the stairs. I think he is too excited with his new-found feet to notice. I'm kind of down and out with a sore throat/cough thing for the past few days, so I was treating myself with vitamin C and cough syrup but none of which seemed to be helping at all. Blogging will resume when I am feeling better. Migraine, irritability, bloating — these are just some of the symptoms that I experience every month. No, am not talking about PMS ... this is about my recurring endo. I notice that I get bloated when I eat certain things but pain level is random. It becomes sharp randomly, then disappears and then appears again sometimes on both sides but most of the times on the left side. I tried to cut out dairy, wheat, caffeine, chocolate, and sugar but each day, I ate foods that contained one of the above except for coffee. This affects fluctuating levels of estrogen and the problem that arise from those fluctuations. None of them good, of course. The doctor recommended a calcium, magnesium and zinc supplement. And he recommended to try the acupuncture treatment. This is my adorable nieces Lindsey and Jovanka. Linds is really enthusiastic in doing things that she likes and appreciates. She’s very talented in music, and she’s very good at playing the piano! Van the younger one is a spark of energy to be around and although she is young, she has more personality and wit than people 20 years her age. Linds has a passion for fashion. 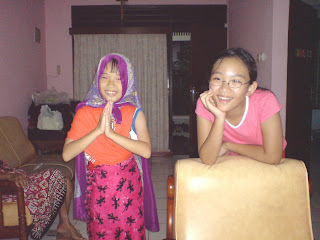 In this pic Linds dressed Van as an Indian girl using the sarong that she normally used to carry around her dolls. 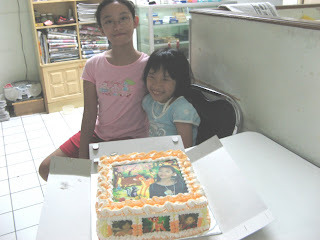 Linds and Van posed together in front of the cake that was specially ordered by their favorite auntie. A Christmas cake for the 2 nieces. I have two nieces from two sisters. Linds was born and lives in Singapore. She is growing up quite fast for a kid her age. She enjoys playing with her dolls and there's one that she likes best until now "Mr. Hippo". The rag doll has been washed a million of times, has lost one of its eye, neck has been sewn several times but she still likes it! Linds is a very independent and strong willed girl. Some of her favorite foods are Indonesian styles fried chicken, kangkong stir fry, chillis, any kind of fruits, Japanese seaweed snacks, and nata de coco. Linds is very serious in her piano lesson because she wants to be able to make money teaching other kids when she grows up. She is also has a passion for fashion design. The little one Jovanka is 8 years old going on 9 in July this year. She sometimes makes you think she is a 20 year old trapped in a little body! She often says surprisingly wise things that are well beyond her years. We call her Van for short! Van is a little comedian, she loves to make people laugh and is very good at it! There's one time we drove for about an hour from my place to the mall in west Jakarta and Van made us all laughed with her stories. She is also a very bright little girl who speaks her mind. She has a very kind heart and a sweet little voice. When Linds came to visit Indonesia, they were inseparable. They even took a shower together. I was so dreading going for a walk this morning. I had set the goal of walking for half an hour everyday, but the hardest part was getting up early. 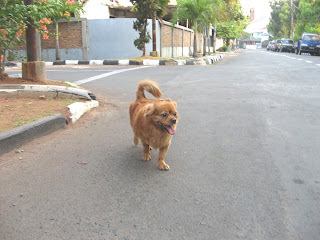 When Fatso was still alive I had a drive to wake up early every morning, sometimes he would wake me up, or I just knew his presence and I would immediately get ready to take him out for his morning walk. We always went out at 5:30AM or a little later to that ... so we could enjoy fresh air and there were not too many vehicles going our ways. After putting it off for more than four weeks, I finally did. And I walked for 30 minutes. Then I ran for ten minutes. Walk again for another ten minutes and I kept this up for an hour with the trip back home. I thought to myself, "If I could just keep this good habit everyday, I might not need to go for the acupuncture every week." The acupuncturist told me the cheapest way to ease the pain of my recurrence adenomyosis is by taking a walk minimum half an hour everyday. Funny how lonely I'm feeling this morning as I passed all the roads Fatso and I used to take. My feet are not sore but my heart is of burning pain. I hope I can get through it. 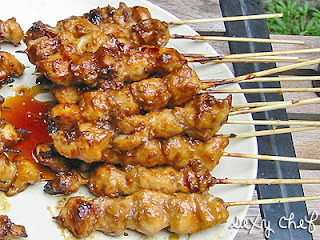 Satay Ayam (chicken satay) is one of my favorite street food. 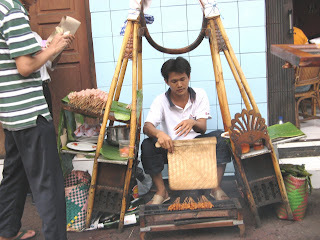 This is one of the stall in Jalan Veteran, an area in central Jakarta. They say street food is the best because it has that extra added flavor! 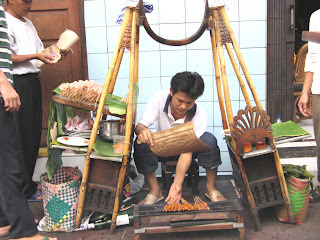 The satay here has been marinated for some time in a mix of fresh chopped shallots, sweet soy sauce (kecap manis), lime juice, and vegetable oil prior to being grilled. After it has been cooked it is topped with spicy peanut sauce, served with rice rolls and cucumber pickle. The last picture is courtesy of SexyChef. 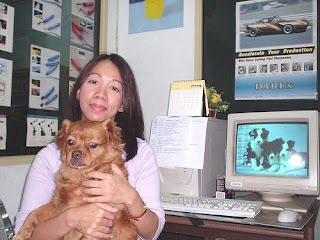 Fatso was my adorable & beloved dog, my faithful friend for 11 years. He passed away last month, on February 4, 2007 because of the stress and the congestive heart failure during the flood in Jakarta. He struggled with the heart murmur condition for the last 2 years but he never would let it slow him down. It still hurts not having him with me now, but I cherish the wonderful memories of our years together. He has meant more to me then almost any human I know. 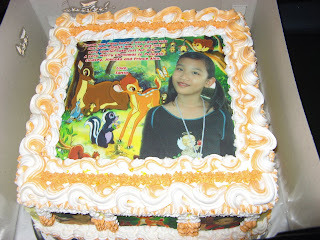 Here is the tribute for Fatso that I wrote on March 4, 2007. 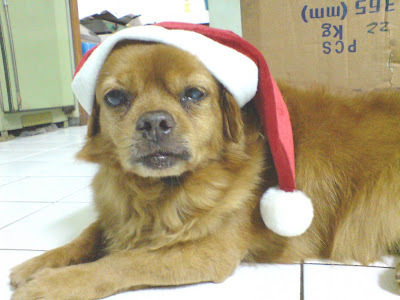 Quick bio : mutt (I think he looked like a Pekingese but his built resembles to a Tibetan Spaniel). Likes : walks, plays and eats! Pet peeves : thunderstorms, rains, fireworks, loud explosive sounds, a visit to the Vet. Favorite food : “Purina” begging strips original flavor, or anything that get slipped to him when the human in his life eat! Favorite walk : anywhere and I didn’t have to worry about the leash! Best habit : not peeing in the house. Best tricks : Fatso specialty was throwing himself on the floor and rolling over when he seeked some attentions or refuse to go home from his walks, this could happen anytime and anywhere. He also liked to fetch the small rock that you found on the street and threw it as far as possible for him to catch. If we played them at home…I normally tapped the rock on the floor and the sound got him excited and he would try to grab the rock from your hand. He often chased me around the house trying to get the rock. Today it has been one month since I last held my sweet boy, Fatso. Not a day goes by that I don’t think of him. I am still reminded of that day on top of the running big truck trying to get him out of the flood area to a friend’s house. I thought that he would pull through knowing that he was a fighter. The sight of him lifeless made me feel guilty for not evacuating earlier. I watched him draw his final slow breath with my tears wetting on his fur. I would never have believed the pain could be so bad for me, but in the end he did not suffer for long. February 4, 2007 truly was the saddest day of my life. I cannot even bring myself to wash the blankie he peed in my bedroom when I tried to catch some sleep (Fatso always peed outside all of his life), in the early hours. When I finally washed it down two days ago, I told Fatso that he could visit me in my dream if he wants his blankie back. Sometimes I find myself looking for him, hoping that he was just hidden away or slept in his favorite spot, somewhere in the house. I’ll never forget the first time I saw him. It was one Sunday afternoon in May or June 1996 when he came out of nowhere in between the gate, his small head popped in as if to welcome me as I was new at the neighborhood that time. I thought he was a stray and named him Choky (for chocolate) even though I later found out that he belong to a neighbor a few block away from my place. When he didn’t come back for several days, I was so worry and looked for him all over the neighborhood. I found him in a house a few blocks away from my place. Fatso was so excited to see me but he was on leashed on a pole inside the terrace. His movement was only as long as the leash. I then decided to talk to the the lady who owned the house about Fatso. Her teenager son was there and told me that Fatso was belong to him. The young man was upset when I told him I would like to adopt Fatso if they let me. I learned he just liked to have a dog but not to take care of them, and they also had another 2 poodles besides Fatso. After a long discussion they finally agreed to give Fatso to me on one condition!!! I could not change his given name “Fatso” and that the little brat was 2 years old by that time. So that’s where I got his name, Fatso. He was a thinso rather than a fatso when I first met him, I think. Fatso was so grateful to be released from his leash and followed me home. I am so glad that his previous owner gave him away to me (they don't know what they missed). Since then we were inseparable..
Fatso truly was my best friend. Being that I am not from Jakarta and don’t have any family here it should come as no surprise that I spent a tremendous amount of time with him. He was there during the good times and the bad. He never judged me or hurt me and all he ever wanted from me was love. He was just such a loveable dog. He was a pleasure to be around and many people loved him. One thing he was especially good at was making friend. He was adored by kids, adults and had many four legged friends in the neighborhood. He has had a heart murmur disease for the last 2 years but otherwise was in good shape. He walked 2 or 3 times a day, he still liked to chase cats around, he was very energetic. There are no words to express how much I love him. And how much I hate that at the end of his life it seemed like everything went wrong for him. Thank you Fatso for being my best companion and sharing your life with me for 11 wonderful years. Thank you so much for all the love, protection, loyalty, friendship, and the laughs you gave me to treasure. Thank you for making my life better. I miss rubbing your belly, taking long walks together, playing rough house, I miss you sneaking in my bedroom when I was asleep, but most of all I miss you in my life. I know that you are out of pain now and back being to your young spectacular self, running, playing and chasing all the cats or birds you meet up there. Never forget that I love you with all my heart and more. Always remember the good times we had together. I hope I will see you again someday. In the meantime ... keep your tail wagging!